While a parrot will chew on her feet as part of her regular grooming, if she does so excessively, it's time to see an avian vet. Several medical conditions can cause Polly's feet to become swollen, inflamed or otherwise irritated, prompting her to chew at them because of the discomfort she's in. Even psychological conditions can contribute to Polly's foot chewing, which is why a vet needs to determine the cause and treatment for her. Parrots can suffer from viral, fungal or bacterial infections of their feet, which may cause their tootsies to become raw, red and inflamed. One cause of foot infections and incessant foot chewing is the avian herpesvirus. This infectious condition is contagious and can be transferred from one bird to another with direct contact. Bumblefoot is a condition that usually involves a bacterial infection of the feet and can result in open sores and inflammation of your parrot's tootsies. This isn't a contagious condition and is usually caused by improperly-sized perches, poor nutrition, unsanitary cage conditions and obesity in birds. Polly can develop dermatitis on the skin of her feet when they come into contact with substances that can cause skin allergies. Nicotine and tar residue from smoking, hand lotion, perfumes and even soap residue on your hands can all trigger an allergic reaction in your bird. Mite infestations can also cause itching and irritation of your avian friend's feet, leading to conditions like scaly leg disease. These arachnid pests are very contagious between birds, although different species infect different types of parrots. Both allergic dermatitis and mite infestations can lead to chewing of the feet and infections of the open wounds caused by the chewing. 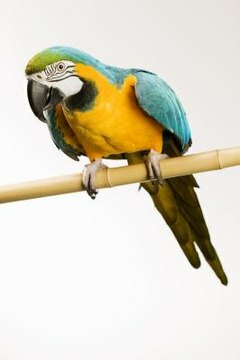 Parrots can easily become bored, leading to a variety of behavioral issues including feather plucking and foot chewing. Self-mutilation is common in domesticated parrots, especially cockatoos and African greys, usually resulting in feather plucking and obsessive chewing of the skin. If Polly is chewing at her feet, it could be because she's feeling isolated, scared or anxious. Her behavior may also be due to a nutritional deficiency, dry skin or a hormonal imbalance. Bathing can help alleviate issues with dry skin in parrots, so give Polly a shallow dish filled with water to splash around in or gently spray her with water every few days. To determine what could be causing your parrot to chew on one or both of her feet, bring her to an avian vet for a complete exam. Your vet can check her feet for signs of infection and perform blood tests to rule out conditions like gout or other systemic medical problems, which can lead to foot issues. He'll likely inspect the feet for any deformations caused by mites and check if the nails of your bird need a trim. Long nails can make walking difficult for Polly, irritating her feet. Your vet may make recommendations to enrich Polly's environment, such as some new toys or perches, if no medical cause is found for her foot chewing. AvianWeb.com: Avian Foot Chewing, Stomping, and Mutilation: The Elusive Cause (in Our Case): Avian Herpes Virus!